Pelagic birding off Southern Africa's shores varies from the warm tropical waters of the north-west and north-east coasts to the cold waters off the south coast. Pelagic birding in the tropical areas is rather slow, but does hold some special birds available nowhere else in the region. One might be fortunate enough to see frigatebirds, tropicbirds and perhaps even boobies in these waters. As one moves further south along the coastline, the birding becomes more spectacular and one begins to encounter certain Southern Ocean species. Please follow the links below to read more about the pelagic species that are available out of various harbours in South Africa. Southern Africa's recorded pelagic species. The south-western Cape offers the best seabirding in South Africa by far and, in fact, the local pelagic birding is considered to be some of the best anywhere in the world. The cold Benguela Current brings highly nutrient-rich waters up from the south, and the strong winds (predominately from the south-east) create an upwelling that brings all the nutrients to the surface. This, in turn, sustains the phytoplankton that form the basis of the marine food chain. 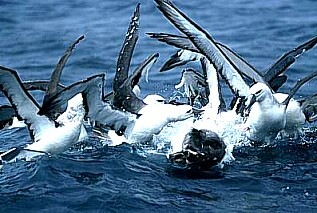 Pelagic fisheries thrive in the area, and discards from the trawlers provide a constant food source for pelagic birds. As one leaves the harbour, the first coastal species that one encounters on a pelagic trip include Cape, White-breasted, Crowned and Bank Cormorants, Kelp, Hartlaub's and possibly Grey-headed Gulls, Common, Swift and Sandwich Terns as well as the endemic African Penguin. The boat then generally heads out into deeper water and tries to locate a trawler. This is a spectacle in itself as it offers one the opportunity to have literally thousands of seabirds at arm's length as they all mull around behind the trawlers. Throughout the year, one has a very good chance of seeing pelagic species like White-chinned Petrel, Sooty Shearwater, Cape Gannet, Subantarctic Skua, the diminutive Wilson's Storm Petrel and 4 species of albatross (Shy, Black-browed and Atlantic and Indian Yellow-nosed Albatrosses). 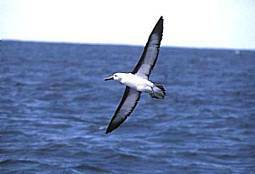 During winter, when numbers of birds are at their highest, other species that are normally present are Southern and Northern Giant Petrel, the spectacularly plumaged Pintado Petrel, Antarctic Prion and Antarctic Tern. Winter trips also provide the possibility of many sought after species including those ocean going giants, Wandering and Southern and Northern Royal Albatrosses as well as Grey-headed Albatross and Antarctic Fulmar. During passage periods (April-May and September-October), other birds which visit our waters reasonably regularly include Great Shearwater, Soft-plumaged Petrel and, with a little bit of luck, Black-bellied Storm Petrel. The summer species lists are augmented with the likes of Cory's and Manx Shearwater, Arctic, Pomarine and Long-tailed Skua, Great-winged Petrel, European Storm Petrel, Sabine's Gull, Arctic Tern and Grey Phalarope. The added adrenaline rush is that there is always the chance of something odd turning up and in the last 2 years, trips off Cape Town have produced Spectacled and Grey Petrel, Flesh-footed and Little Shearwater, Leach's and White-bellied Storm Petrel and South Polar Skua to mention a few. Visit our seasonality tables to find out more about the month for month status of the occurence of the various species in Cape waters. In addition to this, one is almost guaranteed of seeing Cape Fur Seal, with Subantarctic Fur Seal also occurring, albeit rarely. The commoner whales include Southern Right, Humpback and Bryde's Whale, while occasionally other species such as Minke, Long-finned Pilot, Sperm and the incredible Killer Whales are seen. Many dolphins also occur with Common, Dusky, Bottle-nosed and Risso's being the ones most regularly seen. And if one starts getting bored with mammals, you could always turn your attention to the possible Thresher, Blue and Mako Sharks that occur as well as the bizarre Sunfish. Have a look at the schedule of upcoming trips and then fill in our on-line pelagic trip booking form to secure your place on the experience of a lifetime. The open ocean is an extremely challenging habitat in which to look for, and identify, birds. The weather plays a major role in the lives of pelagic birds, and usually the rougher the weather the greater the number and variety of birds, with winds from the south usually being more productive than those from the north. To witness the graceful ease with which these birds use the elements to best effect is a sight not to be missed. It is important to get as far away from land as possible, and an added bonus is to find a trawler (these vessels act as a magnet to many seabirds). When not watching the birds, dolphins (Common, Bottle-nosed, Spotted, Spinner, Hump-backed and Risso's have been seen) and Hump-backed Whales often keep the birders entertained. this is when the birds from the subantarctic regions are most abundant. Birds seen are the impressive Shy, Black-browed and Indian Yellow-nosed Albatrosses, occasionally Southern Giant Petrel, the ever-present White-chinned Petrel, Pintado Petrel and, if it is rough enough, Soft-plumaged Petrel and Antarctic Prion. Sooty Shearwater, Wilson's Storm Petrel and Subantarctic Skua are also common, and Flesh-footed Shearwater and Antarctic Tern are seen on many of the trips. The Mascarene Shearwater and the second Streaked Shearwater were seen on a winter trip. 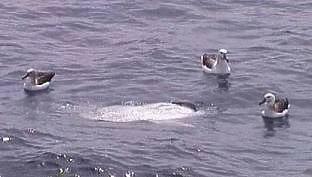 Cape Gannets in their thousands can be seen plunge-diving for sardines. most of the winter birds are still present, and it is the best time of the year for Great-winged Petrel. White-bellied and Black-bellied Storm Petrel are sometimes seen. 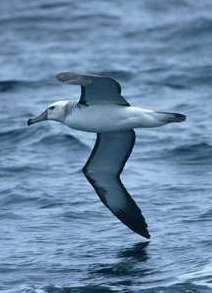 Several rare species have also been picked up, including Wandering Albatross, Grey-headed Albatross (both far out), Slender-billed Prion and Streaked Shearwater. the Indian Yellow-nosed Albatross and White-chinned Petrel remain common, while Shy Albatross are rare. 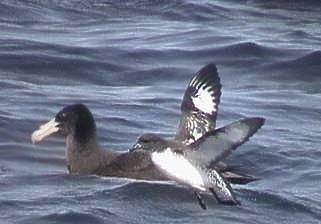 Flesh-footed and Sooty Shearwater can also be seen as can European, Leach's and Wilson's Storm Petrel. Arctic Skua and Arctic Tern are common, with Pomarine Skua recorded on a regular basis, and very occasionally Long-tailed Skua. This is the time of year to try for Cory's and Great Shearwater, and if luck is with you, South Polar Skua. Brown Booby and Black Tern have also been recorded at this time of year. The pelagic birding in the Eastern Cape starts to improve in late May and early June with the arrival of the sardine shoals off the coast. The regular pelagic birds follow these shoals, while others move north from their breeding grounds on islands well south of the coast to escape the severe Antarctic winters. Typical species to be seen at this time of the year include Indian Yellow-nosed, Black-browed and Shy Albatross at no more than a few metres from the boat. In fact, most of the time binoculars become redundant because the birds are so close. White-chinned Petrel and Sooty Shearwater can be seen in good numbers as can Cape Gannet and Wilson's Storm Petrels. The ever present Subantarctic Skuas will even take fish from your hand. Antarctic and Swift Tern can also be seen. Other possibilities include the stunning Pintado Petrel, Antarctic Prion, Soft-plumaged Petrel and maybe even European Storm Petrel. Pelagic trips always seem to provide the unexpected, so anything is possible.